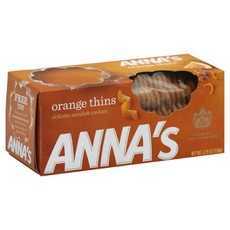 Enjoy Anna's Orange Thins . Anna's Orange Thins Delicate Swedish Cookies. By Appointment To H.M. The King Of Sweden. (Note: Description is informational only. Please refer to ingredients label on product prior to use and address any health questions to your Health Professional prior to use.